The shingled, asphalt roofs that adorn most buildings aren’t expected to do much besides protect us from the elements. In contrast, a green roof, defined as a building roof covered by vegetation planted over a waterproofed layer, can provide habitat for native flora and fauna in an urban setting and sometimes even provide refuge for rare plants as development depletes their natural habitat. For example, a study conducted on one of the oldest green roofs in the world—on the roof of a factory in 1890s Germany—showed the roof acting as a repository, preserving the plants of a surrounding biodiverse wetland in the face of encroaching development. While providing habitat is a critical function of a green roof, the cool vegetative layer also provides numerous other benefits. Green roofs help prevent storm water runoff by providing an increased permeable surface area for water to be absorbed into. Without a permeable surface, rain hits the asphalt roofing, runs down through the gutter system, into the street, and into piping, where it puts pressure on the storm water system. The materials that most cities build with, such as concrete and asphalt, are impermeable—meaning they do nothing to help absorb storm water runoff. Beau Lackey, who conducted research under Schauwecker as part of his Master of Landscape Architecture degree, explained why this costs cities so much money. “Municipalities can’t just stick a new pipe in and be done. They’re constantly maintaining the system, a process which costs taxpayers a pretty penny. By preventing wear, we allow the system to last longer and require less maintenance,” Lackey said. 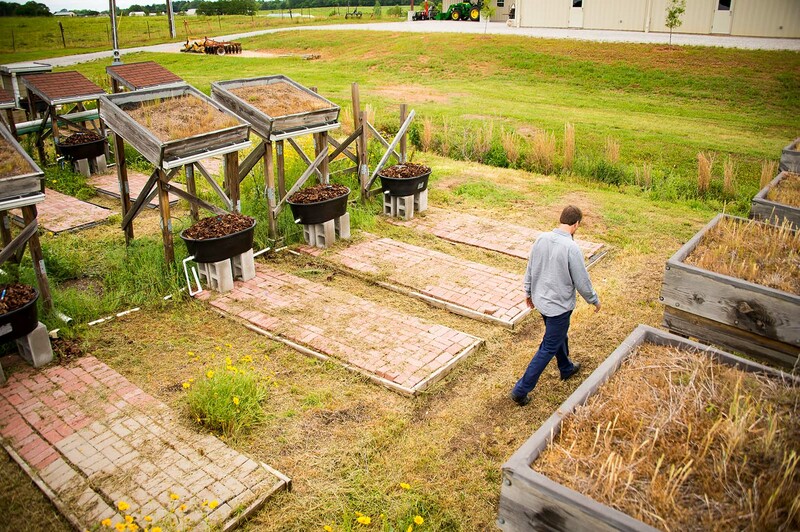 In his research, Lackey developed a mix of rooftop species that are cheaper than the usual rooftop plants, which could help box stores with a large roof surface area to implement green roofs. “When I was first researching green roofs, I realized that there was a really limited suite of species recommended, and many of those were expensive and required regular maintenance and irrigation—which defeats the purpose of a green roof. 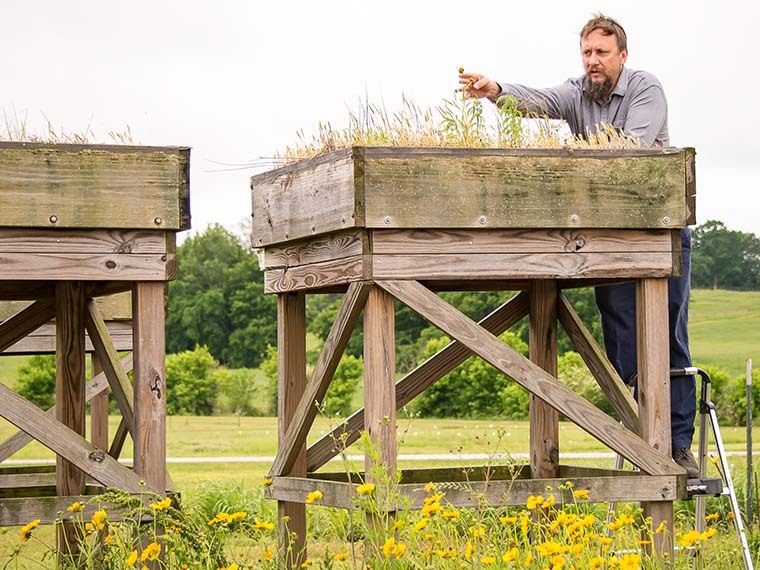 I had seen native grasses grow in regular asphalt roofing, so I knew there had to be a wide range of plant species out there that could survive a green roof setting without much regular upkeep,” Lackey explained. The species most often recommended for green roofs were further restricted to only a few regions and climates. By developing a longer list of species that can flourish on rooftops, Schauwecker and Lackey were able to come up with a less-expensive green roof that works in southern climates. 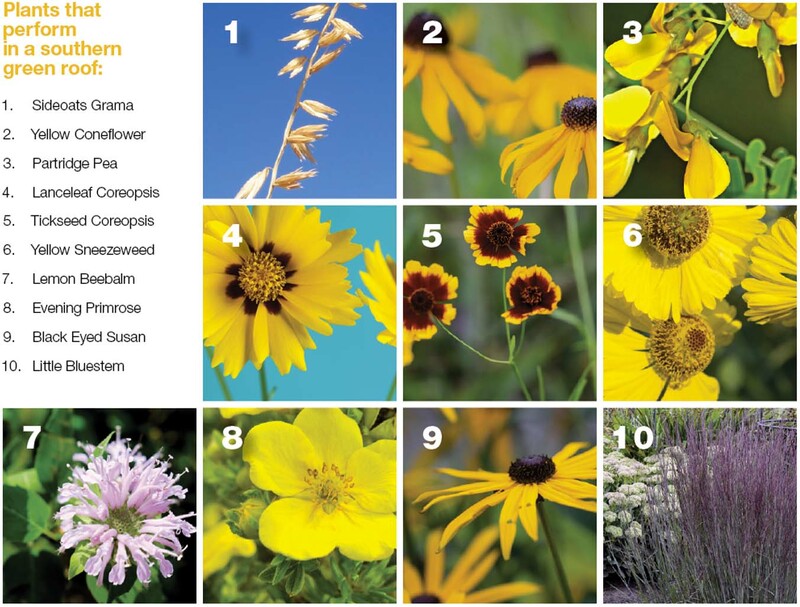 “Instead of going for a polished, garden-like look, we selected hardy, low-maintenance plants—like native grasses and wildflowers—which effectively provide habitat for native bird species while also diverting runoff,” Schauwecker explained. They then placed these plants in simulated green roofs on the H.H. Leveck Animal Research Center, commonly known as South Farm, to see how they functioned. Ten green roofs were established, five with commercially available soil media and five with soil media mixed with native soil. All roofs were planted with native prairie species as plugs and seeds. Because rooftops tend to have high sun exposure, and limited amounts of soil cause quick drainage, it can be a harsh environment for plants. “Part of this study was to see what happened over time. We wanted to see which plants would establish themselves naturally, and how plant composition would change over time,” Schauwecker said. After several years, many of the same species have remained, but several new ones have popped up alongside them—mostly grasses, but a couple of invasive non-native species as well—something that Schauwecker and Lackey had hoped to avoid. Like any green roof, implementation of the system would require monitoring of any invasive species. While the untidy mix of species may not appeal to those seeking a polished rooftop garden, it is more appropriate for places that may not be as visible—such as the top of a big box store. And as city policies change to reflect the cost of storm water maintenance, box stores may have incentive for finding affordable green roof options. “Some municipalities have an impervious area tax, where they charge according to how much storm water a property produces. If you adopt a system like that, it creates an incentive for people to look into ways to reduce their output. It also makes it so that people living in single family homes, with very little space for water to run off, aren’t shouldering fees that are generated by run off from big box stores,” Lackey said. While the typical green roof costs roughly twice as much as asphalt, Schauwecker’s system only costs one third more than asphalt. That, in combination with savings on taxes and heating and cooling costs, makes Schauwecker’s green roof a tempting alternative for businesses. 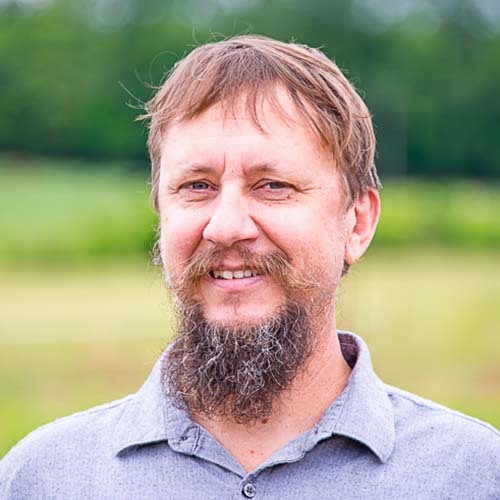 Passion At Work: My primary goal is to make it possible for developed landscapes to function ecologically as close as possible to their pre-development condition.